The Hellfire Ring of Dexterity, Hellfire Ring of Intelligence, Hellfire Ring of Strength, Hellfire Amulet of Dexterity (Dexterity), Hellfire Amulet of Intelligence (Intelligence), and Hellfire Amulet of Strength (Strength) are legendary crafts created by using materials called Organs. These Organs are dropped by special bosses called Uber Bosses, which are located in special realms only accessible during the Infernal Machine events. This guide will tell you everything you need to know to craft the Hellfire Ring and Amulet, including starting the Infernal Machine events and defeating the Uber Bosses. In order to craft these items, you not only need to acquire the required materials (to which most of the article is dedicated), but also to purchase the corresponding recipes. Both recipes are sold by Squirt the Peddler, who is located in Act II: Hidden Camp, for 5,000,000 Gold. You will notice another design for the Hellfire Ring with a price of only 2,000,000 Gold, but this is the recipe for the original level 60 Hellfire Ring. There is no need to buy the old design. After teaching the designs to your Jeweler, you will immediately notice that you can only craft a single Hellfire Ring, but you have the choice between three Hellfire Amulets: Dexterity, Intelligence, and Strength. What this means in practice is that the stats on your Hellfire Ring will always be completely random: 3 random primary affixes + 1 random secondary affix. On the other hand, you get to choose one of the primary stats of your Hellfire Amulet and, in addition to it, you will get 3 other random primary affixes + 1 random secondary affix. Hellfire Amulets also have an effect that activates a passive skill of the class that crafted it. The passive skill is randomly chosen when the Amulet is crafted and cannot be changed afterwards. The implications of this passive skill effect is that Hellfire Amulets need to be made by the character for which they are intended. Both the Hellfire Ring and Hellfire Amulet require exactly the same materials (or Organs): 1x Leoric's Regret, 1x Idol of Terror, 1x Vial of Putridness, and 1x Heart of Fright. The next sections will tell you exactly how to get these items. The Hellfire Amulet also requires 10x Forgotten Souls. The entire farming process is exclusive to Torment difficulty and is made much easier and much faster by playing with other people, especially if you have a full group. Each of the four Organs you need in order to craft a Hellfire item is only dropped from a specific Uber Boss. Each Uber Boss is located in a specific realm, which is only accessible after crafting a specific Infernal Machine and using it in the Heretic's Abode in Act I - Tristam. You will find the list of Organs and their origin in the table below. Infernal Machine of Fright is dropped by Nekarat the Keywarden in Act IV - Gardens of Hope Level 2. As we pointed out earlier, playing with a group makes the farming process much faster, because the entire group can use a party member's Infernal Machine. Also, the Keywardens spawn at random locations, so a group will find them much more rapidly than a single person. The drop rates depend on the difficulty and are as follows (from D3 Resource). * 100% + 10% means that you are certain to get 1 item and have a 10% chance of getting a second one. In this section, we are going to tell you how to get the Infernal Machines, which you can then use in the Heretic's Abode in Act I - Tristam to get access to the corresponding Uber Boss. The location of the Heretic's Abode in Tristam is shown in the screenshot below. By default, the entrance is closed and you need to make an attack with your character next to it. This will destroy the planks of wood barring the entrance and allow you to enter. Odeg the Keywarden spawns randomly in the Fields of Misery and he has a chance to drop the Infernal Machine of Regret. Odeg is a ranged Goatman who always has the Jailer and Molten affixes. He does a spear attack that knocks you back and he has a cone attack that shoots 3 fireballs towards its target. Much like any other ranged Goatman, Odeg keeps fleeing from his targets, which can be frustrating because of the molten trail he leaves behind, due to his Molten affix. Pushing him into a corner will make the encounter less frustrating. Upon dying, he will explode, due to his Molten affix. Sokahr the Keywarden spawns randomly in Dalghur Oasis and he has a chance to drop the Infernal Machine of Putridness. Sokahr is a Dune Dervish who always has the Mortar, Electrified, Vortex, and Missile Dampening affixes. Much like any other Dune Dervish, Sokahr has a Whirlwind attack that causes him to spin and deal damage. While spinning, he uses his Mortar, which can end up being quite deadly after Vortex, so you need to keep moving for the duration of the Whirlwind attack. Sokahr can easily be spotted because of his Missile Dampening affix, which creates a sort of bubble around him. Xah'Rith the Keywarden spawns randomly in Stonefort and he has a chance to drop the Infernal Machine of Terror. Xah'Rith is a Morlu Incinerator who always has the Teleport affix. Unlike other Morlu Incinerators, he uses Cold spells that apply Chill and he summons Rain of Frozen Corpses (instead of the usual Meteor). This raid of Frozen Corpses covers a much wider area than the usual Meteor and inflicts a lot of damage. His melee knockback and Teleport can both be frustrating, but as long as long as you dodge his Rain of Corpses and avoid frozen patches, Xah'Rith is not much of a challenge. Nekarat the Keywarden spawns randomly in Gardens of Hope Level 2 and he has a chance to drop the Infernal Machine of Fright. Nekarat is an Aspect of Terror who always has the Jailer and Nightmarish affix. Much like other Aspects of Terror, Nekarat is extremely fast, has an extremely powerful fiery melee attack, and can apply a curse that reduces healing by 75%. Occasionally, Nekarat spawns a fiery patch on the ground that can be deadly and should therefore always be avoided. In this section, we are going to explain to you how to defeat the Uber Boss that is located in each of the 4 realms accessibles from the Infernal Machines. In the Realm of Discord, which you access by using the Infernal Machine of Regret, you have to fight and defeat Leoric and Maghda for a chance to obtain Leoric's Regret. Melee Attack - Leoric always swings his mace at his closest target, inflicting a bit of damage. Teleport Smash - Leoric teleports at a player's location and smashes them with his mace, inflicting damage. Summon Skeletons - Leoric summons Returned Archers, Skeleton Archers, and Shield Bearers in melee range of a player. The summon can be interrupted with a stun or a freeze. Spinning Strike - Leoric spins three consecutive times, inflicting a lot of damage to anyone caught in his path. Forcefield - At 75, 50 and 25% health, Maghda becomes invulnerable and performs a Summoning Ritual. Summoning Ritual - Maghda summons 3 Berserkers (4 at 50% health and 5 at 25% health). When all enemies are dead (including Leoric), the Forcefield deactivates. Moth Dust - Maghda summons a cloud of Moths that slowly follows a player around for a limited duration, inflicting a lot of damage to anyone touching it. Arcane Enchanted - Maghda summons rotating beams of arcane energy, which deal significant damage to players who touch them. Once the encounter starts, you should focus on killing Leoric first, as Maghda becomes invulnerable as soon as the Forcefield comes up and it does not deactivate unless you kill all enemies, Leoric included. Since Leoric teleports, it is wise for the party to stand in his proximity in order to keep him in place. His attacks are rather harmless, so as long as you avoid his Spinning Strike, by moving out of melee range, and dodge Maghda's Arcane Enchanted and Moth Dust, Leoric is easy to kill. The Berserkers from Maghda's Summoning Ritual can be dangerous and you need to make sure that you dodge their Berserker Slam and that you kill them swiftly in order to remove Maghda's invulnerability. Since Maghda has a tendency to flee from melee targets, you should back her up into a corner. There, pay special attention to Arcane Enchanted and Moth Dust. In the Realm of Chaos, which you access by using the Infernal Machine of Putridness, you have to fight and defeat Ghom and Rakanoth for a chance to obtain Vial of Putridness. Chomp - Ghom chomps his melee target, inflicting damage. Gas Cloud - Ghom spawns Gas Clouds at a player's location. They linger in the area for some time and anyone standing in them receives damage. Acid Slimes - Ghom will spawn slimes that chase the closest target, inflicting damage if they manage to touch them. Cleave - Rakanot hits anyone standing in front of him. Blade Strike - Rakanoth teleports to a player and inflicts damage to them. Volley - Rakanoth throws spinning blades towards a player, inflicting damage to them. Summon Minions - Rakanoth spawns several Soul Devourers. With enough self-healing to survive Gas Cloud, you and your party members can easily dispatch Rakanoth first. Otherwise, killing Ghom first makes the encounter easier. You should stack Ghom and Rakanoth on top of each other and focus on killing Ghom. Rakanoth will occasionally teleport out, spawn Soul Devourers, and/or perform Blade Strike. As far as positioning goes, it is important to note that anyone standing outside Rakanoth's melee range is a potential target for Blade Strike, while Ghom spawns Acid Slimes on players outside a Gas Cloud. Once Ghom is dead, Rakanoth becomes an easy target. In the Realm of Turmoil, which you access by using the Infernal Machine of Terror, you have to fight and defeat Siegebreaker and Zoltun Kulle for a chance to obtain Idol of Terror. Tripple Slam - Siegebreaker strikes the ground in front of him three times in rapid succession, inflicting a large amount of damage to players caught in the strike and knocking them back. Charge - Siegebreaker charges at a player when there is no one in his melee proximity. Stomp - Siegebreaker stomps the ground, inflicting damage to nearby players. Grab and Smash - Siegebreaker grabs a random player in his melee range, lifts them up in the air, and smashes them into the ground, inflicting a lot of damage (potentially lethal if you do not have enough Resistance or Vitality). Reflect Damage - Siegebreaker reflects damage back to the attackers. Fiery Boulder - Kulle launches a Fiery Boulder towards a player inflicting damage to anyone standing within a small area around the point of impact. Slow Time - Kulle creates a bubble that slows movement and attack speed of any player caught in it. Collapse Ceiling - Kulle causes portions of the ceiling to fall on the ground, inflicting damage to anyone standing in the areas hit by the falling rocks. Energy Twister - Kulle spawns Energy Twisters that inflict a substantial amount of damage to anyone caught in their path. Vanish - Kulle vanishes and reappears at another location shortly after. You can kill the bosses in any order, but dispatching Zoltun Kulle first will make the encounter significantly easier. At the start of the encounter, a player (preferably the one with the highest survivability) should rush towards Siegebreaker's melee range and tank his damage and abilities in an effort to prevent him from charging other party members. This will allow them to focus on Zoltun Kulle. Zoltun Kulle uses a wide range of abilities, which can all be avoided unless you get caught in Slow Time. So, you should always move out of Slow Time immediately and not wait until you notice that you are in imminent danger. Kulle occasionally teleports to another location, which simply prolongs the encounter. Once Zoltun Kulle is dead, Siegebreaker is fairly easy to deal with. Make sure to avoid his Tripple Slam and move out of his proximity in order to avoid damage from Stomp, unless you are a melee character. When a player get grabbed in preparation for Grab and Smash, Siegebreaker does not let go of them until he finishes his cast, so if you keep him stunned or frozen, you will lose DPS. Simply let him finish his cast and smash the player. Finally, stop damaging Siegebreaker if you are about to die from Reflect Damage. In the Realm of Fright, which you access by using the Infernal Machine of Fright, you have to fight and defeat Diablo for a chance to obtain Heart of Fright. Curse of Anguish - Increases damage taken and reduces healing taken. Curse of Hatred - Increases damage taken and damage done. Claw Rip - A basic melee attack that can apply Curse of Anguish or Curse of Hatred. Hell Spikes - Diablo spawns shadows on the ground. Shortly after, anyone still standing in these shadows is encaged in a Bone Prison. Charge - Diablo rushes towards a distant enemy when there are no targets in his melee range. 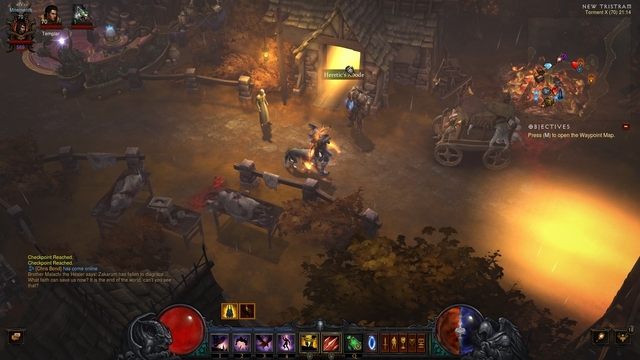 Ring of Fire - Diablo shoots a fireball towards a player's location. Upon impact, it explodes and leaves behind a ring of fire, which deals moderate damage. Lightning Breath - Diablo performs a Lightning Breath at its target and slowly rotates around for 180 degrees. Throughout the encounter, you need to constantly avoid getting hit by the fireball from Ring of Fire and Lightning Breath. You also need to move out of Shadow Ring and Fire immediately. When Diablo reaches 75% and 50% health, a random Uber Boss with reduced health spawns. You should prioritize taking out the Uber Boss before focusing back on Diablo. Ideally, you do not want Diablo to spawn another Uber Boss while the previous one is still alive. When Diablo reaches 25% health, he summons a Shadow Clone of himself with exactly the same set of abilities. As long as you have killed the Uber Bosses that spawn at 75% and 50% health, respectively, you should have no problem avoiding mechanics from Diablo and the Shadow Clone at the same time. 07 Aug. 2017: Adjusted drop rates. 23 May 2016: Added a screenshot to show the location of the Heretic's Abode. 12 Jan. 2016: Infernal Machines were renamed in 2.4 and Heart of Evil is now called Heart of Fright. 01 Sep. 2015: Fixed location of Nekarat, who was moved from The Silver Spire Level 2 to the Gardens of Hope 2nd Tier with Patch 2.3. Drop rates for the Infernal Machines were also updated to include values form Torment VII to Torment X. 25 Aug. 2015: In Patch 2.3, the keys were removed. The Keywardens now drop their corresponding Infernal Machine, making the farming process much easier.